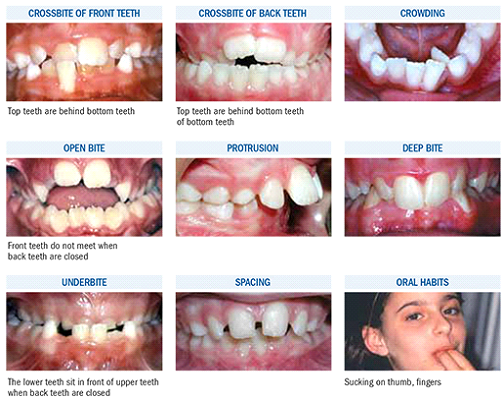 Phase I treatment involves diagnosing and correcting orthodontic problems early in childhood in order to help the jaws develop in a way that accommodates permanent teeth and allows the upper and lower jaws to fit together properly. • Banded Palatal Expander: This type of expander has metal rings that are glued to the back molar teeth. • Habit Appliance: This appliance is used to eliminate unwanted habits such as thumb sucking or tongue thrusting. At times, this appliance will also be incorporated into a palatal expander. • Space Maintainer: This appliance is used to hold space as permanent teeth erupt. • Headgear: This is a removable appliance, used mostly at nighttime, which helps to guide jaw growth into a more favorable pattern.